Polyvore.com allows you to "mix and match images from anywhere on the web to create outfits, interior designs, or any kind of collage." So if you ever wanted to see how pieces looked together before buying them, and you don't want to print, cut and paste or use Photoshop, this might be handy. See the above example that someone made right here. Polyvore keeps a record of where each product came from so you can track it down later. Share your image with others or embed it on your blog. Hi! Did you notice how much the registration/log in looks like a google account log in? Just thought that was interesting. I didn't! Now I gotta go look. Yes, maybe all Jessicas like orange. Who knew? It is so easy to use. And also a nice tool for planning out a packing list for a trip when trying to figure out your outfits and accesories. Yesterday the cool calendar, today a fun collage site ... you are on a roll. Thanks for the great resources. Thank you for sharing this! This is a great resource for those of us who don't have Photoshop. i bookmarked this a while ago via creature comforts but haven't given it a try yet and didn't pay too close attention. seems fun and easy. ps did the quilt market happen yet? lol the room you made is too cute! Good thing you do things like that, though because I like looking! Guys, I can't take the credit for that orange room since I didn't make it. 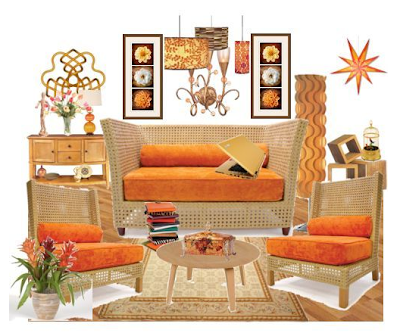 I just found it on Polyvore and thought it was a good example of what you COULD do if you were planning to redecorate your living room or something. Apparently the Jessica who made it also loves orange! LOVED this! Had the best time making outfits, but don't dare register for fear I'll do nothing else EVER! I'll blog about this on Elle Decoration (see http://elledeco.blogspot.com) tomorrow, with a link back here. Thanks! WOW! I always wondered how so many of the 'creative' types made their great collages. Thanks for the tip. Thanks. I am now officially sucked into the computer for good. This is quite wonderful and addictive! Thanks, is really cool service. Another site like this is PicJoke.com - make a collage online - they make a new effect every day!